Rescuers searched submerged villages in southwest India on Sunday in a desperate hunt for survivors after floods killed at least 370 people and drove more than 700,000 from their homes. Entire villages in Kerala have been swept away in the state's worst floods for a century. Rescuers fear the death toll will rise as they reach areas almost entirely underwater. Thousands remain trapped -- often without food or water -- in towns and villages cut off by the floods, and heavy rain forecast in coming days threatens to compound the disaster. Nearly 725,000 people have taken shelter in relief camps, state government spokesman Subhash T.V. told AFP on Sunday. Bedraggled survivors massing at evacuation centres have described desperate scenes after days without food or water. 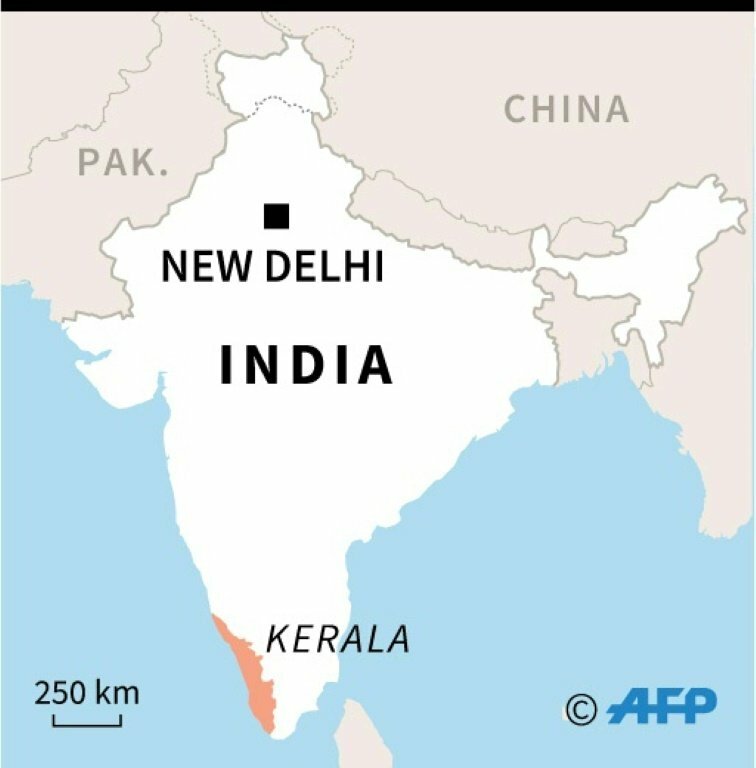 "They were the scariest hours of our life," 20-year-old Inderjeet Kumar told AFP at a church doubling as a relief shelter in the hard-hit Thrissur district. "There was no power, no food and no water -- even though it was all around us." The overall death toll in the state since the start of the monsoon on May 29 had reached 370, the spokesman said. Forty-six of them were found dead in just the last 24 hours. 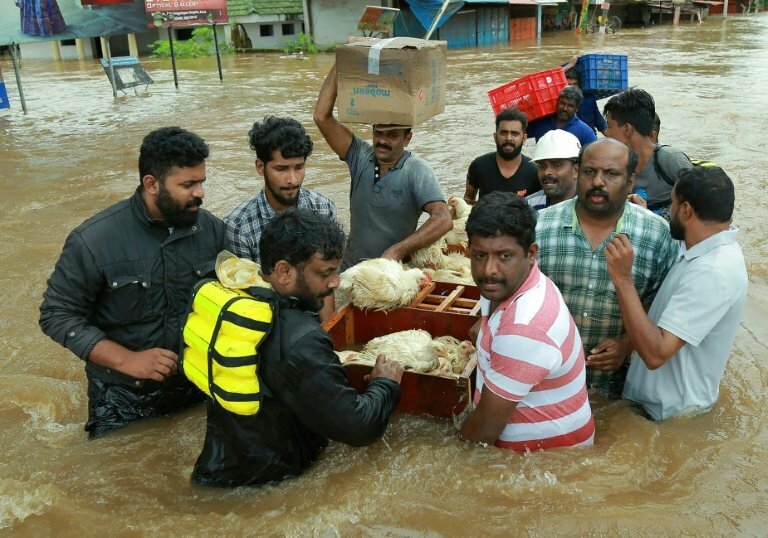 In Thrissur, rescuers searching inundated houses discovered the bodies of those unable to escape as the floodwaters quickly rose. "They didn't think that it would rise this high -- 10 to 15 feet at some places -- when the initial warnings were issued," said Ashraf Ali K.M, who is leading the search in the small town of Mala. "Some of them later gave distress calls when the water rose high and fast," he told AFP at the scene Sunday as the carcases of cattle and other livestock floated past. Among the dead was a mother and son whose home collapsed around them late Saturday. Another was a local man who volunteered for the search and rescue mission. 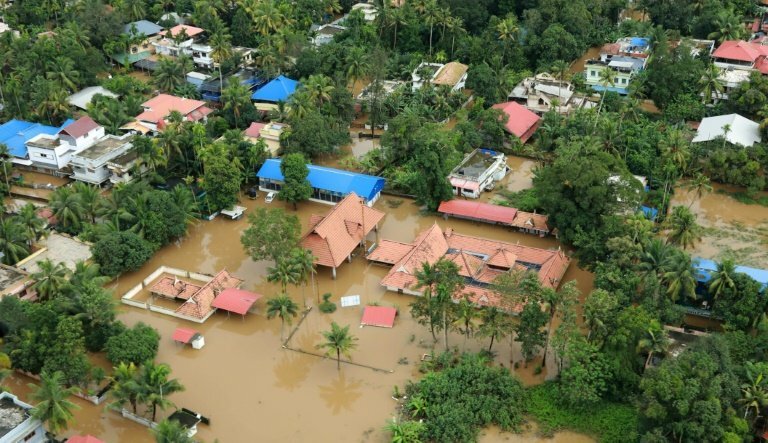 The army said Sunday that 250 people had been evacuated from Pathanamthitta district, many of them sick after days in the pounding monsoon rain. Food, medicine and water has been dropped from helicopters to isolated areas. A train from Pune in Maharashtra state headed south on Saturday for Kerala laden with more than one million litres (two million pints) of drinking water. Roads and 134 bridges have been damaged, cutting off remote areas in the hilly districts of Kerala which are worst affected. Rising torrents of murky brown water swallowed the only remaining road into the town of Mannar, where an estimated 10,000 residents are trapped, The Times of India newspaper reported. The state's Chief Minister Pinarayi Vijayan vowed Sunday "to save even the last person stranded". Fishermen have sailed inland from Kerala's coast to join the search, as volunteers erected soup kitchens and appeals went out worldwide for donations. At St Peter's Square in the Vatican on Sunday, worshippers held aloft signs reading "Pray for Kerala", a state with a large Christian population. "Our solidarity and the concrete support of the international community should not lack for our brothers," said Pope Francis on Sunday. Many panic-stricken flood victims have resorted to appeals on social media, saying they cannot get through to rescue services. In Mala, desperate villagers had to improvise as the floodwaters rose, using kitchen pots as rafts to reach their stricken neighbours. "They used these huge cooking pots to rescue around 100 people in the first wave of flash floods, as no one was prepared (for a rescue)," one local rescuer told AFP. There have been moments of cheer amid the tragedy. In the hilly district of Idukki, rescuers told the Press Trust of India of working through the night to save a newborn boy and his mother from the rising waters. But dam levels remain dangerously high, swollen by monsoon deluges, and more rain is forecast. The Indian Meteorological Department has warned of rain until August 23 across Kerala, including heavy downpours in the districts of Kozhikode, Kannur and Idukki. Idukki has received more than 321 centimetres (126 inches) of rain since June and is now virtually cut off from the rest of the state. 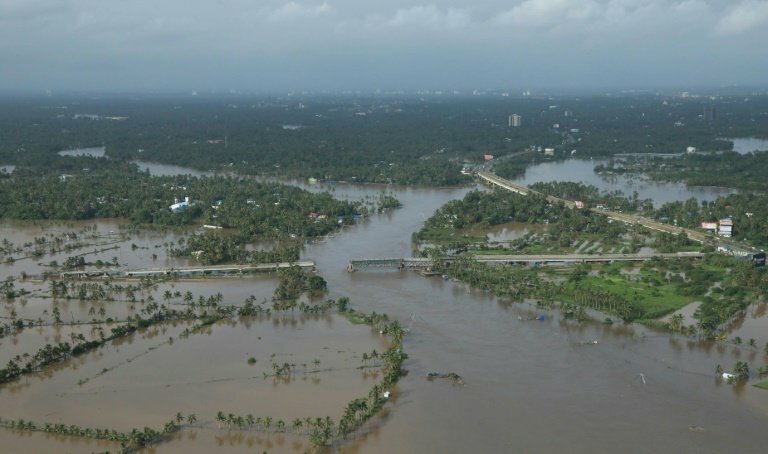 Vijayan, the chief minister, has requested extra funding as well as 20 more helicopters and 600 motorised boats to step up the rescue efforts. Prime Minister Narendra Modi conducted a brief air inspection tour of the state Saturday and announced an immediate grant of $75 million.